My intention was to focus on the way in which masculinity and manhood is presented in the films of the 70s and 80s (particularly crime and action films). However, I just watched a movie that was so good it forced me to examine a 21st century film. That movie is the 2011 Jeff Nichols’ film, Take Shelter. 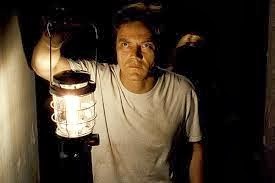 In it, Michael Shannon plays Curtis LaForche, a small-town Ohio man who is beset by apocalyptic nightmares. This film is expertly directed and acted. Nichols is able to create a sense of dread through lingering shots of threatening skies and also, most importantly, through images of everyday places. Never has a country kitchen or an impossibly bright blue and cloudless mid-western sky seemed so claustrophobic and inexplicably terrifying. Yet what compels me to write about this film is Michael Shannon’s stoic, powerhouse performance. Here is a very specific type of man--white, blue-collar who is trying to support his family and survive during an economic crisis. Once the bad dreams start, Shannon’s LaForche must navigate what he first perceives to be a mental breakdown that later deteriorates into a crushing, all encompassing fear. It is the way in which the character handles this terror that makes the film. First, he attempts to hide it, then he tries to deal with it by doing something constructive, literally using his construction worker skills to add on to the tornado shelter in the backyard. Still, this is not enough and his terror becomes so great that he begins having panic attacks and seizures. So many aspects of this film stand out. Yet, what struck me most was an interesting scene with LaForche’s older brother, Kyle (Ray McKinnon). Kyle is concerned that Curtis is losing his mind and visits to try to find out what is happening. When Curtis is vague and dismissive, Kyle threatens to beat him up. Then, after a rather strained discussion, Kyle and Curtis begin to say goodbye. Curtis, in a behavior that is clearly out of character, reaches out and hugs Kyle. It is a very awkward hug and afterwards Kyle, who is stunned by the action, shakes it off. These are men who are uncomfortable with emotion and affection, they deal with things by building and fixing and when something occurs that can’t be handled in that way, they are bewildered and uncomfortable. Later, when the stress becomes so great that Curtis breaks down in front of his friends and family, yelling about the coming apocalypse and finally dissolving into tears, his shame and embarrassment over becoming emotional is palpable. His wife Samantha (Jessica Chastain) seems shocked over the display as well, but is quick to comfort him. There is is so much going on in this film that it can’t be addressed in one post. Not only is about masculinity in a world where the ideas of maleness are changing rapidly, it also deals with issues such as the economy, health care and mental illness. More importantly, the aesthetic of this film is clearly drawn from another era. It appears to take place in the late 70s or early 80s if one judges the furniture and clothing of the characters. The kitchenware and accessories are definitely vintage. One wonders what motivated Nichols' to make this choice. Was it an unconscious homage to the appearance of the films of some of his favorite directors, which include Stanley Kubrick and Martin Scorsese? Echoing Kubrick's The Shining, Nichols' film is a series of mirror images-each scene is followed by its double in later frames-only it is presented on a larger and more dramatic scale. Like The Shining, the scenes that contain LaForche's daughter Hannah (Tova Stewart) are promptly followed by a scene containing LaForche in which he repeats her behavior, just as Danny (Danny Lloyd) and Jack Torrance (Jack Nicholson) were mimicking each other's actions in different scenes. It would seem that Nichols is revisiting a type of 70s masculinity (at the same time he is revisiting the kind of psychological horror present in this era also) in this film. The tormented Curtis does everything he can to hide his torment. He deals with his problems internally and is unable to share them with his wife. He is the provider while his wife sews and sells her work at fairs. Their roles are clearly delineated and his is specifically and stereotypically masculine as hers is feminine.